Exfoliating Body Lotion – 12% Lactic Acid body lotion, provides immediate moisture and gentle exfoliation to treat symptoms associated with keratosis pilaris, dry skin, flakiness, chicken skin, and other dry skin conditions. 8 Exfoliating Body Lotion – 12% Lactic Acid body lotion, provides immediate moisture and gentle exfoliation to treat symptoms associated with keratosis pilaris, dry skin, flakiness, chicken skin, and other dry skin conditions. AmLactin Moisturizing Body Lotion has a special formula with clinically proven lactic acid that’s pH balanced for the skin. Don’t let the word acid concern you. Especially since lactic acid is a naturally occurring humectant for the skin with a certain affinity for water molecules to help keep skin hydrated. And the more moisture that can be retained deep within the skin, the softer and smoother your skin feels. EXFOLIATES NATURALLY – Removes excess keratin and helps your skin heal without the use of harsh or irritating chemicals – Smooths your skin, naturally! DERMATOLOGIST TESTED AND APPROVED – Have confidence in the product you are buying! 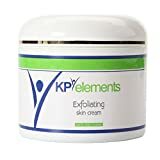 CONTAINS ALOE VERA EXTRACT, Jojoba Seed Oil, Vitamin A, and Vitamin E to cleanse skin and reduce bumps – Cure Your Keratosis Pilaris with KP Elements Body Scrub Today! Most Effective when combined with our KP Treatment Cream – 100% Satisfaction Guaranteed! ENRICHED WITH 8 ESSENTIAL OILS and Vitamins C and E – No harsh or irritating chemicals – Smooths your skin, naturally! CONTAINS GREEN TEA, Chamomile Extract, and Aloe Leaf Juice to Soothe Skin – Cure Your Keratosis Pilaris Today with KP Elements! Most Effective when combined with our KP Body Scrub – 100% Satisfaction Guaranteed! Salicylic Acid and Sulfur soap provides keratolytic, antifungal, and antiseptic action. Salicylic acid alone is mildly anti-pruritic, bacteriastatic and keratolytic. This effect is due to the lowering of pH at the surface of the skin, improving the hydration of the keratin layer. Salicylic Acid and Sulfur in combination are synergistic, and support normal keratin formation. Bar soap is particularly convenient where larger skin areas – like on your face, or your neck, back, or arms, – are involved. Avoids the messiness often associated with lotions, or ointments. Has salicylic acid and sulphur been recommended to you for topical application? Has your family doctor or dermatologist recommended SAL3 soap because of your seborrheic dermatitis, psoriasis, keratosis pilaris, or body acne on your face, back, or neck? Or, you’re dealing with the itching and worry caused dandruff, and you need an advanced soap? Salicylic Acid works as both a keratolytic and comedolytic agent by causing the cells of the epidermis to shed more readily, opening clogged pores and neutralizing bacteria within, preventing pores from clogging up again by constricting pore diameter, and allowing room for new cell growth. We offer a large 100 gram, 3.5 ounces, soap bar! Ingredients: Active Ingredients are 3% Salicylic Acid and 10% sulfur. The soap builds a soothing lather, perfect for sulphur application. Suggested directions for use: Unless otherwise directed by your physician, work up lather using warm water and wash entire affected area with a fresh towel, or with just your hands. Because excessive drying may occur, start with one application daily, then gradually increase to two or three times daily if needed or as directed by a physician. If bothersome dryness or peeling occurs, reduce application to once a day or every other day. 3% Salicylic Acid, 10 % Sulfur – Large bar size – 3.5 ounces – 100 grams. Fragrance free, No perfume. Refill format item, arriving in an eco-friendly cushioned bubble pack. Keratolytic Action (exfoliant). Supports normal keratin formation. Replaces Stiefel, Sastid, Fostex, Pernox. Also available with free shipping offers in separate listings for Amazon Prime customers. Search ” 2 pack SAL3 “, ” 6 pack SAL3 ” , ” 25 bar Dermatologist Pack – SAL3 ” , and in the Amazon Add on Program in single bar format, search ” SAL3 Cleansing Bar ” . To retexturize. The 2-step system for keratosis pilaris incorporates intensive glycolic acid levels to rid the skin of unsightly bumps and reveal smooth supple skin. Kit contains Body Lotion + Exfoliating Body Wash + Shower Pouf. Discover the Power of Alpha-Hydroxy Therapy If you suffer from dry skin, you know there’s a big difference between short-term relief and long-term therapy. While traditional moisturizers provide superficial results, AmLactin Skin Care is different. Our unique Alpha-Hydroxy Therapy exfoliates, retains the skin’s natural moisture, and draws water to the skin to hydrate so it looks and feels soft and smooth. Experience the difference today! What is Exfoliation? Exfoliation is the process of removing the dead skin cells on the top layer of the skin. The body does this naturally, but as we age, dead skin cells may not be shed as efficiently. Environmental factors and diet may also slow this natural process, leaving the skin looking flat, dull, and scaly. You can encourage your body’s natural skin cell renewal process by manually exfoliating, for example by using a loofah or pumice stone, but that can be unhygienic and aggressive, damaging the skin’s surface. A more gentle way to support the natural process would be to apply a lotion or cream with ingredients designed to exfoliate. AmLactin products contain alpha-hydroxy acids that are pH balanced for the skin. These powerhouse ingredients do double duty – they gently exfoliate to reveal healthy-looking skin and draw moisture to the skin so it feels soft and smooth. Thick, rich cream for persistently rough, dry areas like feet, elbows, etc. maximum strength 12% Lactic Acid. smooth even the roughest and driest skin. prevent and protect severe dry skin conditions on elbows, knees, and hands. Works great for dry, flaky skin on feet and softens stubborn calluses. Dry skin causes dead skin cells on the skins surface. Using a body scrub or loofah alone will not do it. Body Lotion to remove years of accumulation and build up. significantly transforming your skin to achieve healthy and more vibrant skin. Order Now, 30 Day Money Back Guarantee. Highly effective exfoliating lotion treatment specially formulated with a maximum strength 12% Lactic Acid and a unique blend of fruit acids and rich emollients to smooth even the roughest and driest skin. Stimulates cellular regeneration to prevent and protect severe dry skin conditions on elbows, knees, and hands. Works great for dry, flaky skin on feet and softens stubborn calluses. Gets rid of chicken skin (keratosis pilaris) on upper arms. Treats red bumps on upper thighs and buttocks associated with mild body acne. Dry skin causes dead skin cells on the skins surface. Using a body scrub or loofah alone will not do it. Use Beauty Facial Extreme’s Exfoliating Body Lotion to remove years of accumulation and build up. Beauty Facial Extreme’s products work, and they work extremely well. We stand behind our products 100%, with a guarantee of significantly transforming your skin to achieve healthy and more vibrant skin. Order Now, 30 Day Money Back Guarantee. EXFOLIATES: your skin will help you have a healthy & rapid renewal of skin cells – dead cells and useless keratin are erased & replaced by new cells that are beautiful, smooth, & soft. CLEARS OUT: clogged pores and peels of dead skin and any junk causing skin congestion or blemishes. Find more keratosis pilaris products on Amazon!